Hey Weekly Standard: Could you correct that Obamacare tax thing? Sounds simple enough, right? Until further investigation reveals that this exemption is claimed directly on the tax return. Thatâ€™s right â€“ the tax return youâ€™re not required to file. While the circular nature of this exemption is ludicrous on its face, its effects are far-reaching and incredibly regressiveâ€¦. Itâ€™s a safe bet that many members of this population will not be cognizant of their need to file simply to avoid the Obamacare penalty for being uninsured. [â€¦. ]compliance with this behemoth law disproportionately burdens the poorest of the poor.Â Like a shark silently stalking its unknowing prey, Obamacare lurks waiting to take a bite out of the unwary. And in this case, itâ€™s the poor. Yet another stupid Rube Goldberg application of the Nanny State, right? Â Well no. actually. ACAÂ has its share of glitches and complications. But this isn’t one of them.Â As ACA legal expert Timothy Jost notes over email, Pinter is wrong. If you are not required to file a tax return and donâ€™t want to file a return, you do not need to file a return solely to report your coverage or to claim an exemption. This isnâ€™t Nanny State. It isnâ€™t Rube Goldberg. Nothing behemoth. No shark is stalking or biting. Itâ€™s not particularly complicated, either. The Weekly Standard should run a correction on this important point. *A friend notes that my description of Ms. Pinter as a tax attorney conveys the impression that Ms. Pinter is someone whose main duties are assisting people with their taxes. Her byline says: “Kimberly Pinter is a tax policy lawyer and writer in Northern Virginia.” Her Twitter byline notes that she is a “Tax policy expert, lawyer, lobbyist, jewelry designer, and Zumba fitness instructor.” Â Sounds kindof cool, actually. **Update: I received a very professional email from the Weekly Standard.Â To their credit, they are now looking into this. I await a correction or amplification. Author Harold PollackPosted on April 4, 2015 April 6, 2015 Categories Health & MedicineTags Affordable Care Act8 Comments on Hey Weekly Standard: Could you correct that Obamacare tax thing? Martin Luther King supported health care as a human right. He also knew how far we had to go as a nation in making that right a reality. Many of the shaded states such as Wyoming and Montana are huge but sparsely populated. Others such as Wisconsin have small populations left uncovered for other reasons. Writing about President Obama’s record on drug addiction treatment without mentioning the passage of the Affordable Care Act and the development of the regulations for the Mental Health Parity and Addiction Equity Act (MHPAEA) is analogous to writing about LBJ’s record on health care without mentioning Medicare and Medicaid. But alas, Christopher Ingraham of the Washington Post is the latest journalist to do so. The transformative impact of the ACA and MHPAEA on addiction treatment is not a hard-to-uncover secret. It has been written about extensively in the scholarly literature (see for example here and here) and in the mass media (see for example here and here). But like a number of other journalists, Ingraham critiqued the Obama Administration’s alleged lack of commitment to drug treatment without even mentioning either landmark piece of legislation. So on the one hand, yes – it’s true that more federal dollars are going toward drug treatment. On the other hand, treatment and prevention account for less than half of federal drug spending, most of which still goes toward law enforcement efforts. This conclusion rest on the false assumption that an administration’s financial commitment to addiction treatment is equal to federal spending on addiction treatment. But the ACA and MHPAEA are major federal actions that drive private dollars into addiction treatment by improving coverage for over 100 million people with private insurance. Analyzing what an administration has done in any health care policy area without looking at its laws and regulations for private insurance is generally misleading, and is certainly so in this case where none of the private investment is captured in federal drug control budget data. Health care policy analysts generally see the Obama Administration’s addiction treatment record as the most praiseworthy in at least 40 years, and some journalists (e.g., Jesse Singal) have done a fine job reporting that fact. That does not however make it less disappointing to see yet another misinformed article written as if the ACA and MHPAEA never happened. 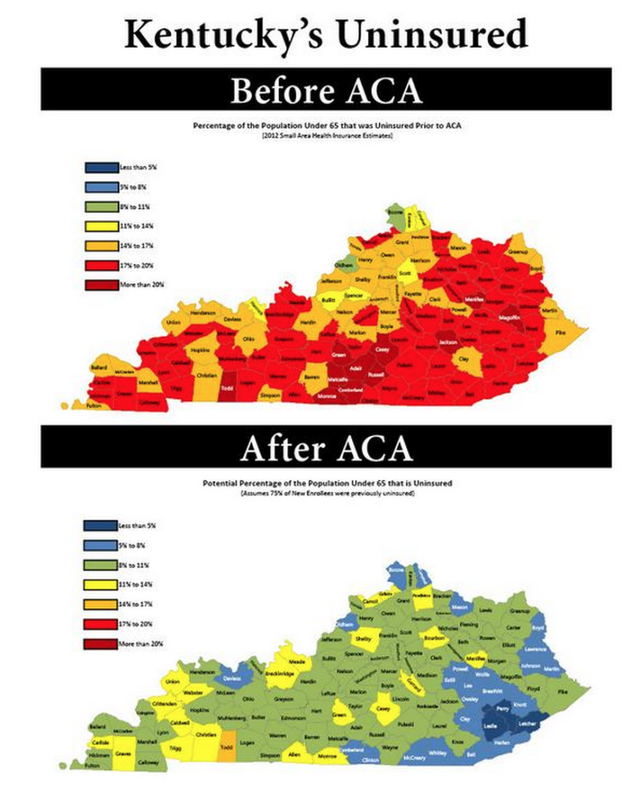 Via the indispensible Sarah Kliff at Vox, this pre-post map of Kentucky health insurance coverage puts a lump in my throat. 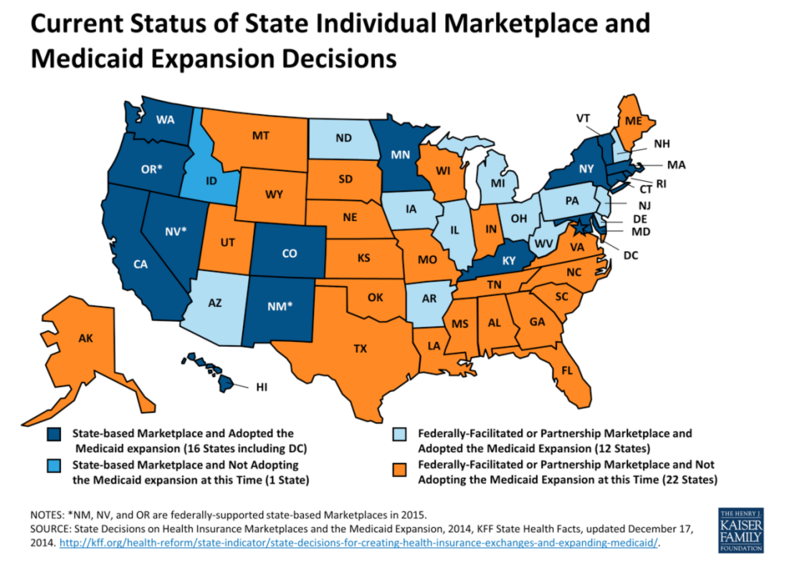 This is what we fought for ACA, and what we will eventually achieve when low-income red states eventually embrace the Medicaid expansion. I’ll never be involved in another presidential campaign as I was with the Obama campaign and the fight for health reform between 2007 and 2012. I knocked on hundreds of doors, made I-don’t-know-how-many-phone-calls in the hope of achieving near-universal coverage.Â Maps like this make me so glad that I participated in that fight. That map reflects hundreds of thousands of lives changed, in a single small state that went against President Obama, big time, in both 2008 and 2012. More from Sarah Kliff here. 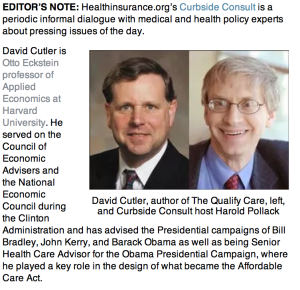 My latest Curbside Consult at healthinsurance.orgÂ was a conversation with Harvard economist David Cutler regarding his book, the Quality Cure. Trying to make David Cutler look impressive for our interview…. Our wide-ranging conversation covered his pride in health reform, his thoughts on how our health care system is changing, Princeton Universityâ€™s high-ranking law school, and his disappointment in implementation screw-ups typified by the flawed rollout of HealthCare.gov. We covered the full range of health-wonk topics. Emanuel is scathing about many short-term implementation failures of the Affordable Care. Yet he is quite bullish about health reform’s long-term prospects. There are a few surprises, too. For starters, Emanuel notes that ACA might have included further malpractice reforms had physician groups or Republican senators really wanted that. Whatever was said in public, behind closed doors doctors didn’t prioritize malpractice; nor were Republicans ready to actually negotiate about it. President Obama and others were ready to deal–were there a deal to be had. Emanuel also offers some striking blue-sky predictions. Most notably, he predicts that the long trend of explosive health care cost growth will abate. Over the coming decades, he predicts, health expenditures will grow no faster than the national economy: “GDP+0.” If this actually happened, our nation’s public finances would be fundamentally different. Never a Better Time in U.S. Mental Health Policy? Did the period from early November through early January comprise the most remarkable advances in the history of federal mental health policy? It’s a defensible argument. 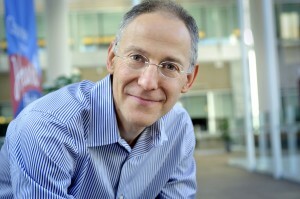 To learn why, check out my latest post at Stanford School of Medicine’s SCOPE blog. I was a discussant of Casey Mulligan’s paper Average Marginal Labor Income Tax Rates Under the ACA at the UNC Tax Symposium hosted in Chapel Hill, NC by Doug Shackelford this past Saturday. His figure 3 summarizes changes in the marginal tax rate of labor income over the past 7 years, accounting for both explicit and implicit taxes for someone with median wages. For example, in 2014, there is an increase in the marginal rate due to a reduction in work incentive that occurs for someone with median wages because premium subsidies are based on a income-linked sliding schedule–an implicit tax on earning more because you lose insurance subsidy as you earn more income. The paper also identifies increased implicit incentives to work more, for example, the fact that exchange subsidies cannot flow to those below 100% of poverty.